“Fundraise for charity in connection with a race” occupies a high priority spot on my bucket list. I’d always secretly admired people who made the commitment to raise funds along with committing to training for a race itself, and I made it a point to donate what I could to each of my friends who sent out a fundraising plea in connection with a walk or run. 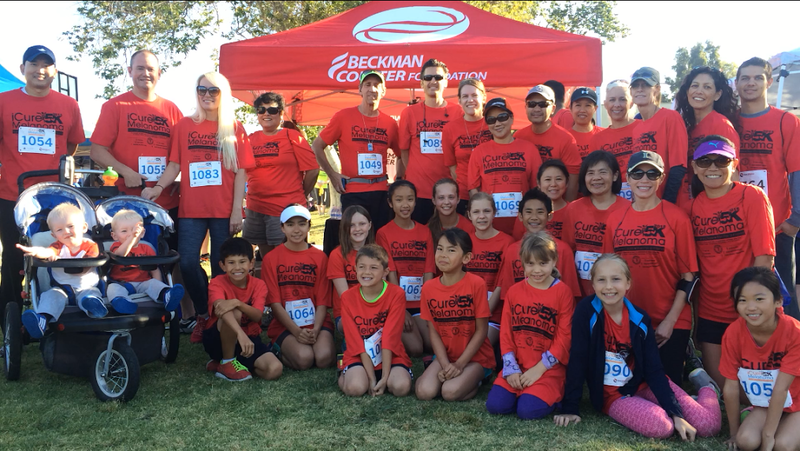 Finally I’ve gotten the opportunity myself to fundraise in conjunction with the iCureMelanoma 5K Run/Walk on May 3, 2014, in Fullerton, California. So far “Team Book It!” has raised $935 towards melanoma research at the University of California, Irvine (UCI) Melanoma Research Division. 1. Choose a race, a location, and/or a cause that have meaning to you. The race I chose is a local trail race that makes it easy for many of my family members and friends to participate. Also, it helps me ask local businesses to support the race and charity, because those businesses know that the race participants are some of the most likely candidates to take advantage of their businesses. Melanoma Cancer is rated as the fastest growing cancer in the U.S. and worldwide. In fact, recent statistics reveal that 1 in 50 people will develop invasive melanoma in their lifetime. Some of you may know that I used to be an estate planning lawyer. One of my clients, a long, long time ago, came into the office for estate planning. One of the paralegals in my office pulled this person aside and offered advice about getting evaluated for potential skin cancer. Two months later (thankfully after the estate plan was in place), the person passed away from a particularly aggressive cancer. The risk of developing skin cancer is especially significant for endurance athletes like runners and triathletes who spend a lot of time in the sun. I had no qualms about supporting the important research being done in this area. 2. Investigate the charity and how the funds raised will be used. Is the affiliated charity a 501(c)(3) non-profit charity to which donations are tax deductible? How does the charity rate on Charity Navigator and similar sites? What percentage of the funds raised will go to pay for the race, and what percentage will be donated to the designated charity? In my case, it is the goal of the race organizers to pay for the race expenses through sponsorships so that all of the registration fees and donations go directly toward melanoma research. 3. Make it a group effort. I am lucky that my book discussion group decided to read Running Like a Girl: Notes on Learning to Run in conjunction with running this local 5K. That’s allowed us to solicit donations from my friends and family PLUS the friends and family of my friends. Don’t discount the fact that race registrations also benefit the charity involved. Team Book It! has 25 members with the hope of more, and all those registration fees benefit the charity. 4. Make friends with the race director. The race director is your best resource for materials and methods to ask for donations from local friends and businesses. Often a race director will have drafts of letters and sponsorship materials that you can pass along to potential corporate sponsors and business donors. 5. Capitalize on connections. Either you or your team members are bound to have connections to local businesses that will be happy to support your race efforts. Do you buy your running shoes from a local running store? Do you work out at a local gym? Is your friend on the board of a company that promotes health and fitness? 6. Use social media. What else are Facebook, Twitter and other social media for than to promote just such fundraising campaigns? I cannot imagine a better use of social media. 7. Don’t be shy. Now is not the time to be modest about your fitness efforts. Post about how hard you are training to do your best at the race. Ask for support! You might just be surprised how many people are willing to chip in what they can to support your fundraising and training efforts! 8. Consider unique fundraising methods. If you have a unique skill, take advantage of it! Can you run a bake sale where the proceeds benefit your charity? Do you have crafty friends who would be willing to donate hand-crafted items to be sold online to benefit the cause? 9. Pay your friends back in kind. If you want your friends and family to support you in your efforts, make sure you give back what you can when they ask the same. 10. Thank each donor personally. Pay attention to the donor roll or ask the race director to give you the names of people who donated to your fundraising. Write a personal thank you note, or, if you think the donors would not mind, thank them on social media for their contributions. It’s not about the amount, it’s about the fact that the donors were kind and generous enough to give what they could to support you, your race, and your charity of choice. Have you ever raised funds in connection with a race? Do you have any advice to offer?